THE BRITISH RAILWAY STORIES LTD: "Don't Let It Bring You Down"
I must confess that the last year has been somewhat of a drain mentally on me. The fear of not finding work (now thankfully dissolved for the moment, for I start work next Monday!) coupled with the exhaustive efforts behind the scenes to develop The British Railway Series further, along with all the other problems of life, including my own and my family's health had taken their toll by about June this year. I was so glad to get away for a week with the Missus to Turkey, and while I was there I couldn't switch off. Stories were written on napkins, in my Red and Black notebooks, even on a towel when I couldn't find a piece of paper at the beach! The part of my brain which thinks on new stories never switches off. You see, it's become so ingrained in me, the desire to tell a story, and a historical one at that, that the plethora of books & magazines managed to take over my room for a good long time, until I did the sensible thing and annexed the attic to make a library! The characters I write about are more than just models with clay faces now. The potential of this series to grow and become something wholly more meaningful is there, more than ever. There's one thing I'd like to address, however. There's been a lot of talk recently amongst the Thomas fandom: some of it good, and some of downright nasty. There will always be someone wanting to pull others down. This is a fact of life I have recognized for some years. It first manifested itself at school, in a particularly cynical individual, whose only goal in life was to bring others down because he didn't have any dreams for himself. The older I get, the more I understand this level of intelligence, and how to ultimately defeat it. That part is simple, treat it with the contempt it deserves. Ignore the jibes, and the insults, and the detriment. There will always be someone, somewhere, wanting to bring you down. Whether it's jealousy, fear, or something else, you must always rise above it - because if you don't, then you may as well stop breathing now! One of the more ludicrous things I've heard - from a few sources - is that a few individuals feel the aim of The British Railway Series is to take down Thomas & Friends! Forget the fact that one is a multi billion pound industry, which is the number one children's brand worldwide, and forget that one is made in an attic using whatever spare parts and old model trains that can be found! The major difference lies in the aims of the two entities. One makes an astounding profit every year. The other makes an astounding pauper of its creator every year! One is aimed at the pre-school market, the other is aimed solely at the 7-9 market, and written to that age bracket accordingly. My intention has never been to take on the little blue engine - quite the opposite, particularly as I am still a fan of the little blue engine in my heart of hearts. What I want to do, is that which is always overlooked; the history of Britain's railways, and make them more accessible to children through the medium of talking trains. At the same time, if I can make through the sale of each book, a monetary donation to a good cause in railway preservation - then that too, is an aim worth working towards. To tell the story of our railways, our preserved railways, and give something back in the same breath. There is nothing that would please me more, than to sell a book relating the history of a preserved railway, and the volunteers which run it, that would encourage children to look it up and gain an interest in their local preserved line, as well as the book financially supporting the railway in question. If it has to be done with faces on engines - so be it, because it is a tried and tested way of bringing more emotional connections between children, and the iron horses they read about. Engines with faces have always existed in British literature, stemming from as far back as the Rainhill Trials in 1829, through the medium of satire, cartoons, and into children's literature, not just from The Reverend W. Awdry's Railway Series; from Sammy the Shunter through to the drawing at the top of the page, found by Jim Gratton recently. 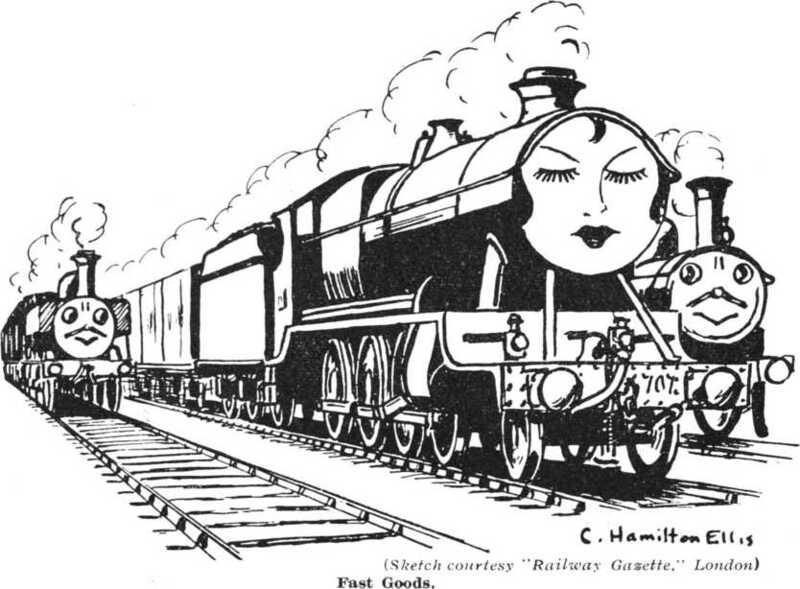 The drawing was done by a C. Hamilton Ellis, a renowned railway historian and artist in his own right, for The Railway Gazette, in the late 1930s. The drawing depicts a 47xx "Night Owl" on an express freight - the elegant face of the female engine a stark contrast to the old time faces of the Pannier tank and Dean goods to the left and right of her. The point is simple. Anyone could draw a face on a train. It's been a very British thing to do, ever since the dawn of the steam locomotive. The difference comes in the writing, the aim of the story within. My aim is to educate and entertain in the same stroke of the pen. 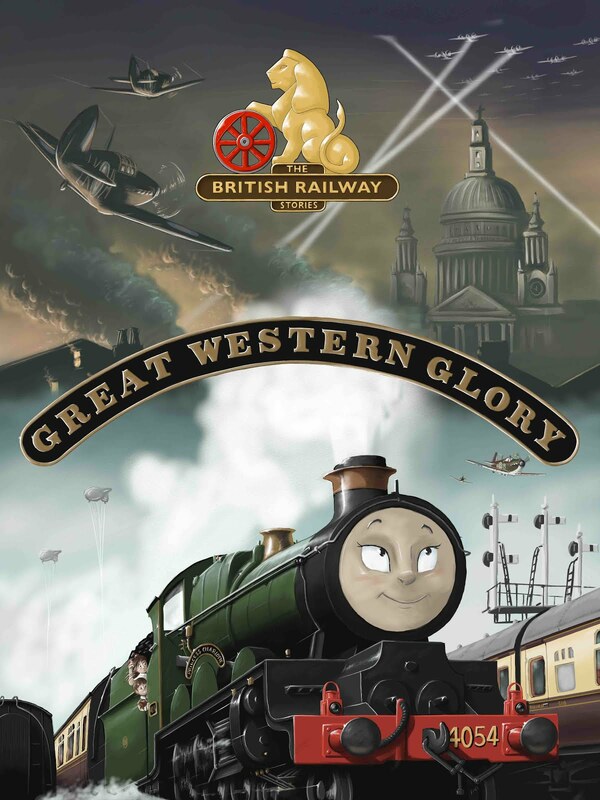 To highlight railway history and to tell it in a way that children will both understand and appreciate for what it is. I only need glance at my inbox this morning to see that I must be doing something right. Emails galore, another forty on top of the hundred and thirty six emails I still need to get through, from young fans who've seen the videos on Youtube, to parents who've seen the videos through their children, and the associated blog and website. The overwhelming positivity I get for writing my stories far outstrips the one or two people who, from time to time, feel the need to voice their negativity with friends of mine. You see, no one ever tries to discourage me directly. They know they wouldn't break me. I've come this far, and not given up. The hardest days are ahead, but that's okay. I'm not going to let it bring me down - and neither should you. If you have a dream, or a story to write, and think you won't make it: try anyway! You may be surprised by what happens, and what response you get. There will always be critics looking to stop you succeeding, as opposed to the necessary critics wanting to help you succeed. Don't let it bring you down.